Barley is a nourishing and satisfying grain that is perfect for vegetarian dishes. According to the Whole Grains Council, people who eat barley report having greater satiation and eating fewer calories when barley is part of a meal. Try these hearty barley dishes for your next meal. 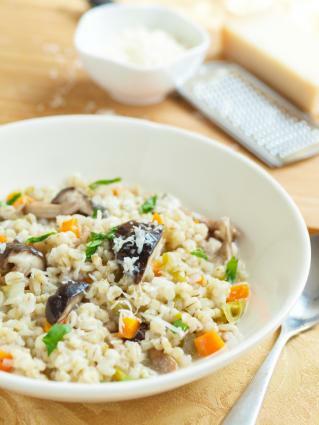 Making a barley risotto in a slow cooker helps you eliminate all of the stirring necessary for a typical risotto. Soak the dried mushrooms overnight in the vegetable broth for even more mushroom flavor. Serve it with a simple side salad for a delicious meal. The recipe serves 4. The night before making your risotto, bring the vegetable stock to a boil in a small saucepan. Add the dried mushrooms. Cover and allow it to cool on the countertop. Then, refrigerate the mixture overnight. In the morning, heat the olive oil over medium-high heat in a large saute pan. Add the onions and cook, stirring occasionally, until they are soft, about five minutes. Add the mushrooms, 1/4 teaspoon of the salt, and 1/8 teaspoon of the pepper. Cook until the mushrooms are soft, about five minutes more. Remove the rehydrated mushrooms from the broth and chop them finely. Put them in the crockpot, along with the broth, the onions and mushrooms, the pearl barley, thyme, carrots, wine, and the remaining 1/4 teaspoon of salt and 1/8 teaspoon of pepper. Stir to mix. Cover the slow cooker and cook on low for six to eight hours or high for three to four hours. Stir in the Asiago cheese and parsley. Serve immediately. Don't use the dried porcini or button mushrooms. Instead of steeping the mushrooms the night before in vegetable broth, just add it to the slow cooker in the morning. Saute the onions by themselves and add them to the slow cooker with the other ingredients. Leave out the mushrooms. Instead, add one zucchini that has been chopped and one cup of cubed butternut squash. Replace the wine with the juice of two lemons. Thirty minutes before cooking is done, stir in 2 cups of peas. To make this recipe vegan, leave out the Asiago cheese. You can replace it with a vegan cheese, or even stir in some nutritional yeast over the top to give it a cheesy flavor. This recipe calls for a vegan shredded cheese, such as soy or hemp cheese. If you aren't vegan and eat dairy-based cheeses, feel free to substitute with Monterey Jack or cheddar. This casserole makes a meal all by itself, or you can add a fruit salad on the side to help cool down the spices. Preheat the oven to 350 degrees Fahrenheit and spray a 9x13 inch casserole dish with nonstick cooking spray. In a large saute pan, heat the olive oil until it shimmers. Add the onions, green pepper, and jalapeno and cook, stirring occasionally, until the vegetables are soft, about five minutes. Add the kale and cook, stirring frequently, until it wilts, about three minutes. Add the black beans, tomatoes and peppers, cooked barley, and corn and stir to combine. Add the chili powder, cayenne, cumin, cilantro, salt, pepper, and lime juice. Cook, stirring frequently, until everything is warmed through. Pour the casserole into the prepared casserole dish and sprinkle it with the grated cheese. Bake in the preheated oven until the casserole is hot and the cheese is melted, 30 to 40 minutes. Serve topped with sliced avocadoes. Replace the tomatoes and peppers with a 14 ounce can of chopped tomatoes, undrained. You can also replace the tomatoes and peppers with your one cup of your favorite salsa. Barley has a slightly nutty flavor that complements many casseroles. It's also hearty and filling, so it's the perfect grain to add to all kinds of casseroles. 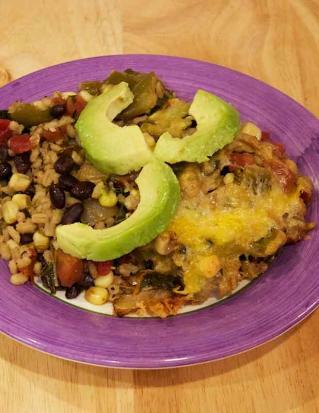 If you've never had barley before, add some for a delicious and filling meal.